Electrification is gaining a lot of attention as efforts mount to reduce greenhouse gas emissions (GHG) and address climate change. There is an important role for energy efficiency in these efforts. In fact, beneficial electrification – that which reduces total energy, costs, and emissions – is a valid form of energy efficiency. It can complement traditional efficiency approaches, and together, they can help meet energy, GHG, and economic goals. With this in mind, here are three recent studies on electrification’s potential impacts on the electric grid and the demand for natural gas. Taken together, these studies indicate that beneficial electrification will likely increase electricity sales (perhaps substantially), affect peak demand (winter peaks in some regions), decrease use of fossil fuels by end-users, and possibly increase use of natural gas for electric generation. However, none of these studies seems to include substantial efforts to use energy efficiency to reduce energy demand. Such efforts could reduce the costs and grid impacts of electrification. In July 2018, the National Renewable Energy Laboratory (NREL) published a study, Electrification Futures Study: Scenarios of Electric Technology Adoption and Power Consumption for the United States. It looks at the electric system under three scenarios – reference (moderate electrification, in line with the Energy Information Administration’s Annual Energy Outlook), medium (widespread electrification among what it terms “the low-hanging fruit” of electric vehicles, heat pumps, and select industrial applications), and high (transformational change). In the reference scenario, electricity consumption increases 21% over the 2016-2050 period (using moderate assumptions about technology change), resulting in a compound growth rate of 0.65% per year. In the medium and high scenarios, this growth in electric consumption is 45% and 67%, respectively (compound annual growth rates of 1.2% and 1.6%, respectively). NREL’s study includes modest energy efficiency actions; with more extensive such actions, growth rates would be lower. Most of this electricity consumption growth occurs in the transportation sector, with more modest contributions coming from buildings and industry as shown in the figure below. Electricity consumption by scenario (Source: NREL2018 Electrification Futures Study). Also, as illustrated in the figure below, NREL notes that electricity demand currently peaks in the summer over most of the United States (due to cooling loads, depicted in orange below), but with electrification, winter peaks will be more likely, particularly in the northeast and perhaps the southeast as well (shown in blue below). Estimated peak load magnitude and seasonal timing by state for 2015 (left) and 2050 in the high scenario (right). The size of the pie charts corresponds with total electricity demand (GW) during the top demand hour. The pie wedges show the seasonal distribution of the top 100 hours with the highest demand by state (Source: NREL2018 Electrification Futures Study). The NREL study does not document its sector-specific assumptions very well, particularly for the commercial and industrial sectors. Better documentation of these sectors, and likely further study, is needed. The Electric Power Research Institute (EPRI), an industry trade association, released a report in April entitled US National Electrification Assessment. 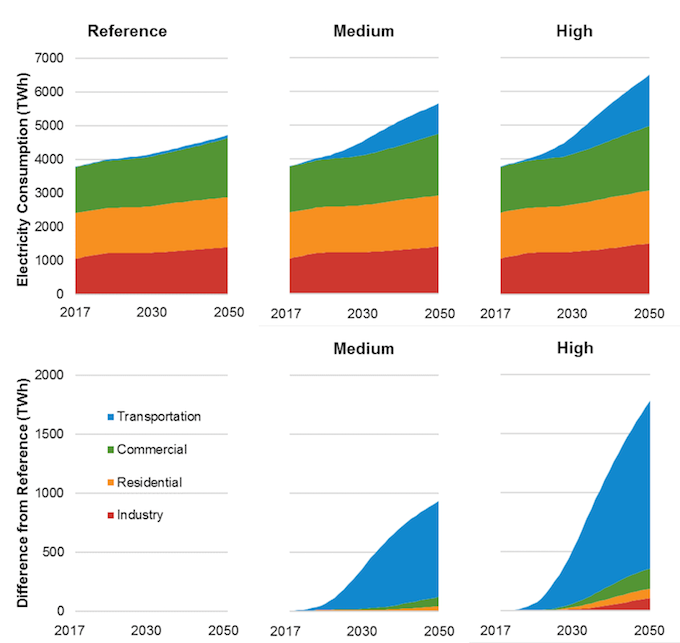 Like NREL, EPRI also looks at electrification opportunities in transportation, buildings, and industry out to 2050 under several scenarios. EPRI has four scenarios – conservative, reference, progressive, and transformation. The results are summarized in the figure below. Source: EPRI 2018 US National Electrification Assessment. Broadly, EPRI’s findings are similar to NREL’s, with electricity consumption increasing 24–52% over the 2015-2050 period, depending on the scenario. It shows “total final energy” use (site energy use) decreasing, but does not report total source energy use (which includes inefficiencies in power generation, transmission, and distribution). If these losses were included, substantially less energy would be saved. It is unclear how much end-use efficiency EPRI includes in its analysis. It estimates carbon dioxide emissions reductions of 19-67%, depending on the scenario, with 20% reductions in the reference scenario and 56-67% reductions in its progressive and transformation scenarios. Interestingly, it shows a 40% increase in natural gas use in the reference case over the 2015–2050 period due to substantial construction of new natural gas power plants. Natural gas use still grows 18% in the transformation case, as EPRI estimates that even in this case, carbon-free generation (renewables and nuclear) would be not quite half of generation, and most of the rest would come from natural gas, albeit much with carbon capture and storage built in the 2020s and beyond. I am concerned that it overestimates the amount of new natural gas generation. The American Gas Association (AGA), another industry trade association, published a study in April entitled Implications of Policy-Driven Residential Electrification. This study has a narrower scope, examining just converting residential fossil fuel space and water heating systems to heat pumps. It examines the economics of halting sales of fossil fuel space and water heating systems in 2023 and ultimately converting 60% of these systems to heat pumps by 2035. Its economic analysis looks at conversion costs, and also the impact of these conversions on electricity demand, particularly winter demand. AGA’s analysis includes substantial costs for new electric generation and transmission systems under two scenarios, one using market-based generation and another using only renewables generation. Its cost breakdown is summarized in the figure below. AGA finds that electrification will be very expensive, increasing consumer costs by $590–1,186 billion on a cumulative basis over the 2016-2035 period (2016$). Based on these costs, it concludes that residential electrification is an expensive way to reduce carbon dioxide emissions. Source: AGA 2018 Implications of Policy-Driven Residential Electrification. These figures should be considered upper-end estimates for several reasons. First, the scenario examined is fairly extreme – prohibiting new fossil fuel systems just five years from now. I have not seen any proposal calling for such a quick change. Second, it assumes that at temperatures below 4°F, all heat pumps will function in electric resistance mode, an expensive way to provide heat and one that would exacerbate winter peaks. Heat pumps specifically designed for use in cold climates can currently be more efficient than electric resistance at temperatures to about -15°F, reducing operating costs (e.g., see here for some Minnesota field test results). Efforts to weatherize homes at the time these heat pumps are installed will reduce loads and the need for electric resistance heat. Furthermore, some existing homes will use natural gas or other fuels rather than electric resistance at very low temperatures, as shown by the Minnesota field study. Third, AGA assumes that 60% of all natural gas, oil, and propane systems will be converted, rather than a more logical conversion scenario that emphasizes the most cost-effective applications, such as homes with oil and propane heat (discussed in a recent ACEEE study) or new construction (discussed in a recent Rocky Mountain Institute study). Fourth, the power plant and grid cost assumptions are not referenced in AGA’s report, but based on communications with AGA and ICF (consultant to AGA), I have learned that the California Public Service Commission’s input assumptions for integrated resource planning, published in September 2017, were often used as a resource for modeling assumptions. It appears that demand response to manage new winter peaks is not included in the analysis. Demand response will often be a less expensive way to meet a portion of peak demand rather than building additional generation and transmission (see here and here). I would also note that AGA’s costs to convert a home to heat pumps are higher than those in the above-referenced ACEEE study. While the total cost estimates in the AGA study are likely high, the report includes an important useful detail – the costs of electrification relative to business-as-usual are not distributed evenly among regions. Net costs are highest in cold regions, particularly ones that primarily use natural gas (e.g., the plains, Midwest, New York, and New England) and net costs are much lower in other regions such as the South, Texas, and West. These results are consistent with prior ACEEE research on the economics of natural gas conversions by region and indicate that efforts to electrify homes using natural gas may currently make the most sense in the South and West. These NREL and EPRI studies paint a consistent picture of rising electric demand under electrification scenarios, particularly for the transportation sector. Electric system planners should factor these potential loads into their forecasts, particularly when planning for system needs in the 2030s and beyond. All three studies indicate that winter peaks will become more common, another issue that should be factored into electric system planning. In this authors view, both the overall growth in electricity sales and the winter peak impacts can be moderated with more investments in energy efficiency. Furthermore, while US utilities have a lot of experience with summer-peak demand response reductions, more attention needs to be paid to winter-peak demand response options. Impacts on the natural gas industry are much less clear. AGA is clearly worried about loss of residential loads. The NREL study indicates a 37% reduction in natural gas sales to end users in its high scenario by 2050, lower in other scenarios. This indicates that natural gas distribution will still be extensive in 2050, but that stranded costs (prior investments that cannot be recovered) could be an issue. Managing costs and cost recovery to handle such a large reduction in sales, without high stranded costs, will require attention from policy makers. However, the EPRI study indicates that if natural gas is used to increase generation, total natural gas use could increase. Given this range of potential outcomes, further analysis of natural gas consumption by sector under different scenarios would be useful. NREL notes in its July 2018 report that it is planning such a study. Even the reference cases in the NREL and EPRI studies project some electrification, particularly in the transportation sector. For the residential sector, recent research has found that some applications (oil- and propane-heated homes and homes in the South) can meet the criteria for beneficial electrification discussed above. For these applications it can make sense to electrify the next time a heating or cooling system or water heater needs to be replaced. But for many homes, electrification may not currently make sense and as a result, natural gas use will likely continue for decades, particularly in the North. All this said, electrification efforts are still in their infancy with many uncertainties. Resolution of these uncertainties will likely take years. This blog was originally written by Steve Nadel, Executive Director of The American Council for an Energy-Efficient Economy(ACEEE). You can view it’s original posting HERE.